I found a bite on my daughter. I was too scared to pop it the first night, but I did take a picture. See top picture. I called the triage nurse at our pediatricians office and she said I didn't need to come in since she didn't have a fever and the redness was almost faded, so I didn't worry anymore. See attached picture. That evening it became red again, so I popped it and blood and pus came out. Is this a spider bite? How do I know if I need to bring her in? Children often get insect and spider bites. These bites are usually hard, red and itchy. Occasionally, a “bite mark” is apparent. Most heal over 1 to 2 weeks without intervention or need for medical care. Insect bites should be cleaned and observed. Often insect bites will appear worse (redder or larger) in the first 48 hours. Any progression beyond the first 48 hours could be a sign of infection. All bites are a potential site of infection. When individuals scratch, rub or squeeze bites they could introduce infection causing bacteria. 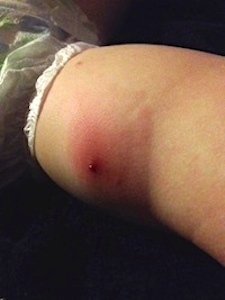 It is often difficult for parents and caregivers to differentiate between a “bad” bite and an infected bite. Your daughter's case appears worse than a typical insect bite. She may have an infected bite, a spider bite or even an abcess. Does she or any of your family members have a history of abcesses (often called boils) or MRSA? Routine insect or spider bites can be cared for and monitored at home. If a bite is worse than usual or shows signs of infection take your child to see their doctor. In your daughter's case, I would recommend you take her to her doctor as her wound is pus-filled and has required drainage.